“If I Stay,” based off the 2009 young adult novel by Gayle Forman, is a heart wrenchingly emotional movie that pulls you in from the very beginning. The film tells the story of seventeen-year-old Mia Hall, an extremely talented, Julliard-bound cellist raised by rocker parents, Kat (Mirielle Enos) and Denny (Joshua Leonard). Throughout her entire life, she has never really fit in with her parents or her brother, Teddy (Jakob Davies), but she finds her place when she meets Adam (Jamie Blackley), a guitar player in a popular Portland band.Everything seems to be going well in her life, but that changes when her family is in a horrible car accident that leaves Mia in a coma. The film consists of scenes switching back and forth between Mia having an “out of body experience,” in which she can walk around the hospital, hear about the impact of the crash on her family, and see her family and friends in the hospital around her, and flashbacks to Mia’s life before the crash. When Mia initially goes into a very important surgery after the crash, the surgical nurse whispers into her ear that it is up to her whether she stays or goes. She has to make the choice. So, throughout the movie, the flashbacks to her life are a representation of Mia’s struggles with whether or not she will stay or give up and go. These scenes pull the viewer up and down from points of humor, laughter and happy moments to low, emotional, and saddening events in Mia’s life. “If I Stay” is an emotional ride from beginning to end. It perfectly shows the impact of love and relationships on the life of a young person and leaves you thinking about events and relationships in your own life. Overall, “If I Stay” is a great movie to go see over the weekend. You’ll laugh, you’ll cry, and you’ll evaluate. 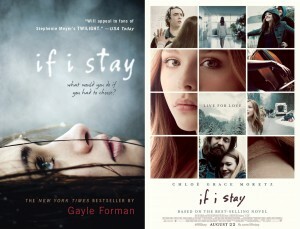 Most importantly, “If I Stay” leaves you with this resounding question: Would you stay?